Commentary on the Zohar of Genesis. Printed by Eliezer Sa’adon. | Rabbi Shimon Lavi (1480-1580) was a polymath expelled from Spain. On his way to Israel he passed through Tripoli and saw the troubles that the community faced, following the destruction of the city by the Spanish, then the Turkish occupation. So he decided to remain and serve as rabbi and head of the community, where he worked greatly to rebuild the community. He was also the doctor of the ruler Yehi Pasha, which helped his goal. He was a great kabbalist though he never knew the Ari or his philosophy. Author of the well-known piyyut “Bar Yochay.” He also wrote a melody for it. The piyyut reached the Ari, whose students in Tzfat spread it around the world. 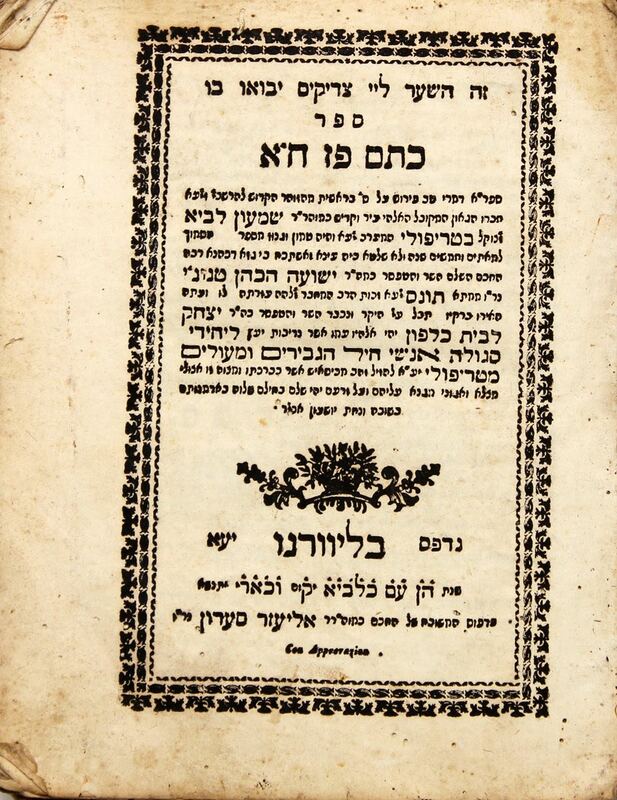 The book Ketem Paz was in geniza for close to 250 years before it was printed by Rabbi Yitzhak Kalfon. | Thick, dark, quality paper, wide margins. Reinforced binding. Leather spine. Pencil listing of ownership handwritten on page 1/1. 2 pages partially disconnected. Moth holes. Rare! | , 280 pages. 29cm. Generally ok to good condition.